Article paru dans la revue bimestrielle Ingénieurs de l’Automobile”, sept. 2016 (2 pages). NEXYAD was received by BMW in Munich this week. From an initiative of BMW France, we were invited in the heart of BMW with two other Laureats of BMW Tech_date : ORIDAO and SENTRYO. The BMW Startup Garage is a special department of BMW that seek for innovative SME’s to work with. The program was pretty complete with presentation of SME’s and their products to an audience of chosen BMW teams, visits of BMW Welt (show room), BMW Museum, and BMW plant. We were very impressed by the welcome of everybody, specialy from Startup Garage ! We want to thank again Carolina, Gregor and Matthias. Next meeting october 5th on BMW Booth at Mondial de l’Automobile Paris 2016. As part of the challenge BMW Techdate, last june, Nexyad is invited to visit BMW facilities and to share with their researchers in Munich. 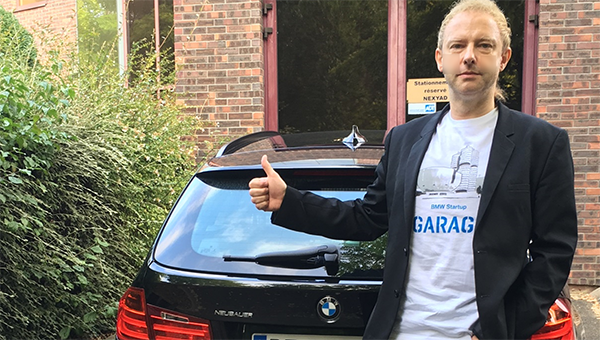 Indeed, as a reminder, Nexyad is one of the three winners of this challenge organized by BMW France to honor the French technology innovations : we had been presented our Onboard Risk Assessment App on smartphone : SafetyNex that measures risk taken by the driver. Gérard Yahiaoui our CEO participated at this time with Serge Naudin President of BMW France to a TV Show on BMF Business. Then Nexyad team will fly monday to the capital of Bavaria for a stay of four days. We already want to thank BMW for this opportunity.